Start your project by scanning your favorite memories with the Flip-Pal™ mobile scanner, and then unleash your creativity with Flip-Pal Digital Creativity Suite 4.0 DVD. This carefully selected software sold separately would typically have a retail value of over $250. The patented flip-and-scan technology of the Flip-Pal™ mobile scanner allows you to scan photos safely while still in the album or frame. 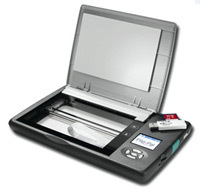 Unlike alternative solutions that do not have the combination of mobility, accuracy, versatility, and keeping the original safe, the Flip-Pal™ mobile scanner is compact, simple to operate, has high resolution, quick scan time, battery power, cordless; no computer required, and onboard memory. Adobe PhotoShop Elements 12: Enter a world of infinite creativity with comprehensive photo editing and graphic design power. Accelerate your photo editing with enhanced layers, more precise selection tools, faster brushes and extensive productivity-boosting improvements. Bring ideas to life with the most versatile photo editing software value anywhere. Photoshop Elements is for both Windows and Mac computers. Family Tree Heritage: Save your trees, charts & research locally with Family Tree Heritage! User-friendly interface and powerful features make Family Tree Heritage the premier genealogy software solution! Powered by Ancestral Quest. Runs on PCs. FileCenter Standard: helps home and professional users scan, organize, edit, archive, and find computer files. Easily. Discover the paperless office solution that’s got everyone talking. FileCenter: simple, but powerful. Runs on PCs.